Locals residing along the Koteshwor-Kalanki road section have been the mostly badly affected by dust from the road work . The 10-km road section has remained under construction activity since June 2013. Division Road Office Lalitpur expects the work to be completed by 2018, a year later than the projected deadline. "When will we get any respite from the extreme dust pollution here?" asked Bimochan Shrestha, an irate local of Matathirtha who has to use the heavily polluted Koteshwor-Kalanki section frequently. "Locals like me will always cough and feel clogging in the nose. I'm worried that the health impact will be severe in the long run, and we remain helpless." Maladies such as stroke, ischemic heart disease, chronic obstructive pulmonary disease, lung cancer and acute respiratory disease are linked to ambient air pollution. These alone are responsible for the annual death of over 9,000 people in Nepal, according to the WHO report. Along with harmful dust and vehicle emossion, the level of air pollution is also determined by the presence of microscopic soot particles known as PM2.5 and PM10. PM10 includes dust stirred up by vehicles and the wind as well as soot from open fires burning fossil fuels. Experts said inhaling these toxins leads to inflammatory reaction by the human body followed by serious health hazards. "These tiny particulates can easily be inhaled and they lodge deep in the lungs and get into the blood supply," informed Dr. Sudip Shrestha, a cancer specialist at Nepal Cancer Hospital, Harishiddhi. According to him, a majority of cancer victims suffer from lung cancer, and air pollution is the third biggest cause of lung cancer in the country. PM2.5 particles are known to be carcinogenic. 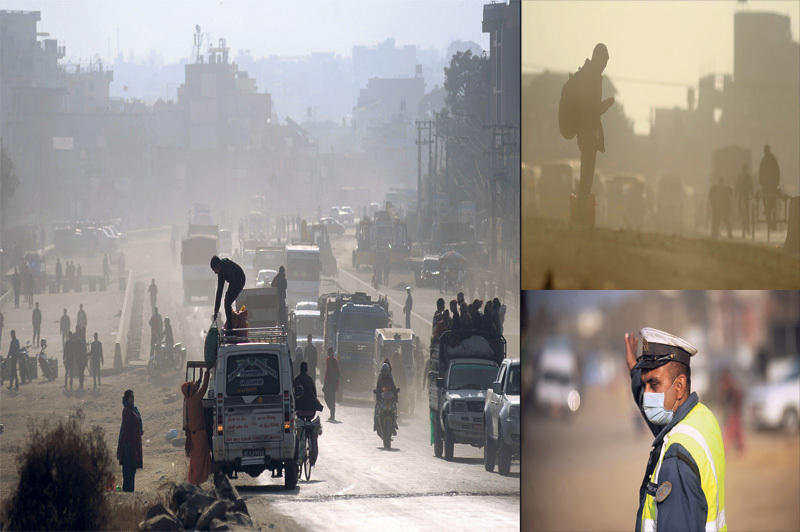 A report, 'Characteristics and sources of PAHs in atmospheric aerosols in Kathmandu Valley', published in 2015 by ELSEVIER journal, has also stated that the air in Kathmandu Valley contains extremely high concentrations of pollutants that can cause cancer. Dr Arjun Karki, senior physician and lung specialist at Grande Hospital, stressed that the growing incidence of chronic obstructive pulmonary diseases (COPD) is a matter for serious concern. COPD, an umbrella term used to describe progressive lung diseases, is characterized by increasing breathlessness. "At an individual level, all we can do is wear masks. But cloth masks commonly found in the market are useless against pollution. N95 masks, which have a special filter, are highly recommended," he added.